A tisket, a tasket, sandwich greens in my basket! 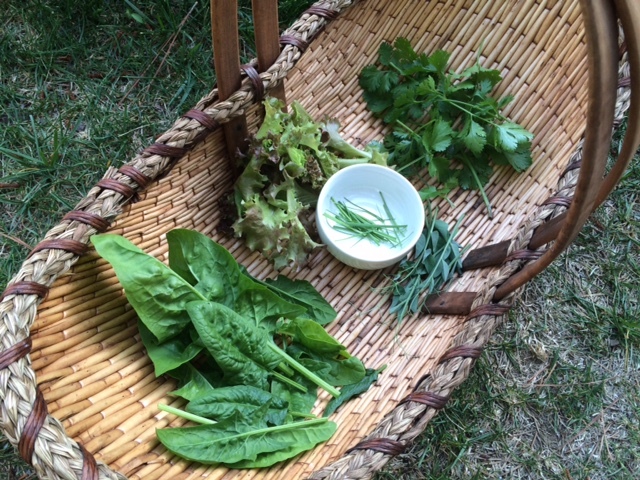 Tonight’s dinner shopping spree in the garden was for accouterments for egg salad sandwiches. Clockwise starting at the bottom is some spinach that is on the verge of bolting in this warm weather, some lola rosa lettuce, cilantro and those olive green sprigs at the 3 o’clock position are sweet pea shoots (trimmed from the growing tips of my producing plants) which add a light, sweet pea taste to any sandwich, salad or stir-fry. In the center are leek thinnings which I use like scallions and add a lightly onion taste to dishes. If you to garden but don’t want to dine on salads nightly, I agree wholeheartedly and suggest we make a nice sandwich instead! This entry was posted in Backyard Gardening, Microgreens, Organic, Square Foot Gardening, Sustainable, Thrift, Urban Farming. Bookmark the permalink.